This tender and touching Russian Matryoshka Nesting Dolls set fills your heart with love and kindness. The Matryoshka Nesting Dolls “Angels” were designed and hand-painted specially for Russian Treasure shop by famous Russian artist. Then Russian Matryoshka Nesting Dolls were given perfect lacquer finish. Why has the artist chosen this subject in his Russian Matryoshka Nesting Dolls? In the whole, angel is a spiritual supernatural being. The subject of angels (God’s messengers) plays a great role in Russian Matryoshka Nesting Dolls art. You can find angels’ images both on folk art and museum quality Matryoshka Nesting Dolls. Though, angels’ appearance may vary deeply according to religious opinions, but mostly angels are given a human shape on Russian Matryoshka Nesting Dolls. The artist of this Russian Matryoshka Nesting Dolls set also represented them in human body. 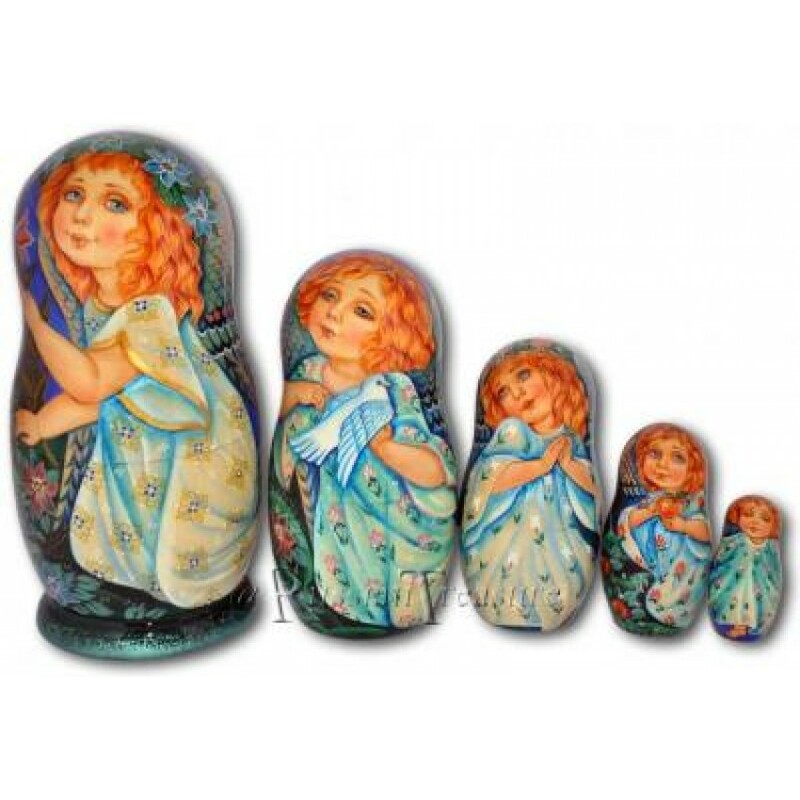 On Russian Matryoshka Nesting Dolls angels are featured as small lovely kids with large sky-blue eyes. One angel is holding a white dove – symbol of peace, the another one carries a red apple in his arms – symbol of forbidden fruit. Angels’ clothes are simple, and at the same time uncommon, they are wearing airy shifts of simple cut, but how subtle the ornaments of fairy flowers are! On Russian Matryoshka Nesting Dolls the angels are painted with folded wings behind their backs. The wings have a great significance - they manifest a nature's sublimity. All the angels, drawn on Russian Matryoshka Nesting Dolls, have expressive appearance – wide-open speechful eyes with long curly lashes, foxy hair and rosy plump lips. All these makes them look very naïve and at the same time very worldly-wise. The characters of the Russian Matryoshka Nesting Dolls set are surrendered with flowers. Also, flowers are twisted in the hair of some angels. While watching this Russian Matryoshka Nesting Dolls you can even feel how the flowers fling their fragrance all around. If you’re about to make marvelous and unordinary gift to the person you love and appreciate, choose these Russian Matryoshka Nesting Dolls, and you won’t regret!